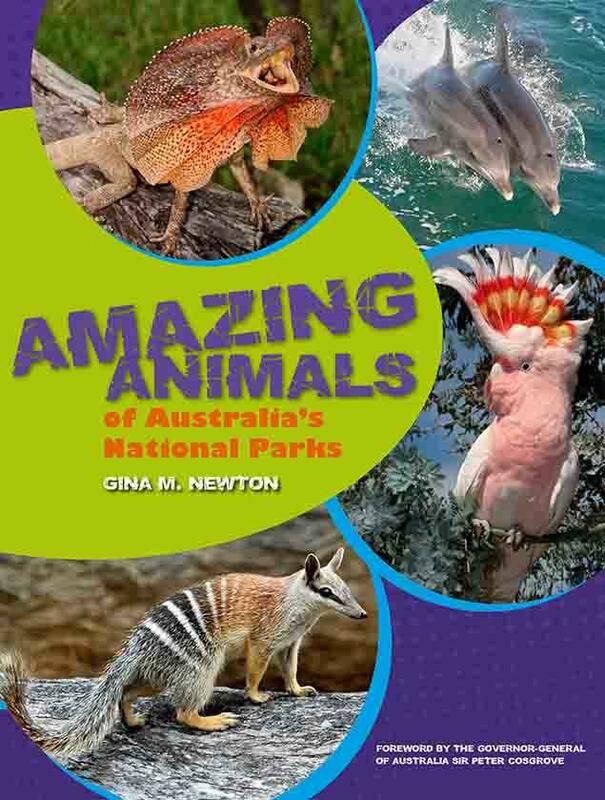 Amazing Animals of Australia’s National Parks is by Gina Newton and is published by NLA Publishing, 2016. Each habitat section opens with photographs of the featured national parks and a description of the habitat. Each animal has its own page, which has a stunning colour photograph of the species, a map of its distribution range, its conservation status and scientific information about the species. The information is divided into the following sections: 'Fast Facts' gives you all the vital statistics, such as size, lifespan and number of young; 'Where Does It Live?' tells you where in Australia you can find the species and provides details about its home; 'What's Its Life Like?' tells you a bit about how the animal moves, behaves, eats and has young; and 'Interesting Info' has quirky and fascinating facts. When I first pick up a non-fiction book, I tend to immediately give it the flick test. I riffle through some pages, checking out the usability of the format and my instant first impressions. Amazing Animals passed with flying colours, disclosing colourful background pages that nevertheless make print easy to read, fascinating closeup photos of Australian native animals, text boxes and maps to break up pages, and easily identified icons for at-a-glance reference. 1. Although the text is probably aimed at children 10+, it is a perfect resource to share with younger kids too, as there’s lots to engage their eyes while you read aloud and discuss. 2. The information is child-friendly. It’s scientific, but not wordy and has features like a decent glossary to help explain new concepts. The facts seem to have been carefully chosen to provide maximum interest to kids, as well as to serve as the sort of summary you would expect to find in a reference book. Fast Fact boxes on each animal stick to a similar format i.e. focus on general measurements of each bush creature. 3. The background colours change according to the area and habitats discussed. So for instance we notice lots of ochres, tans and oranges when reading about the arid zones. 4. The font choices, heading colours and sizes, photo borders, coloured diagonal page divisions and occasional patterned backgrounds might not be what everyone will consciously notice, but they contribute greatly to the very real readability and attractiveness of Amazing Animals. I enjoyed dipping into the book and found myself frequently surprised by the information inside - have you ever heard of a turtle frog? Over 120 animals are in the book and it includes a section on insects too. Kids will love identifying favourite animals, marvelling over species that are new to them and discussing which is the fastest, deadliest, ugliest etc. With gift-giving time just around the corner, why not consider buying a gift the whole family will benefit from? You could use Amazing Animals of Australia’s National Parks as your family guide to nearby National Parks, or reason for road trips to those further afield. Create a checklist of animals you find in the book, and try to spot them in the bush. Can kids identify any habitats they noticed in the book? What facts can we remember about the animals we read about, and that now we see? Does that lizard really run like Uncle Joe? Why would those brown patterns help a bird? Highly recommended for libraries and families everywhere! This excellent, attractively presented resource for older readers would especially suit children interested in Aussie animals and/or national parks, and those studying science or geography. My daughter will love this, I think as a Christmas gift idea will work! She only reads books with animals in them, especially dogs. We are reading Frances Crossno's book Cole's Perfect Puppy, a great sory of friendship and of course a puppy!